Although tomatoes are considered one of the easiest plants to grow, numerous tomato plant problems exist that must be dealt with if you’re going to enjoy those red beauties. From nearly invisible bacteria to creepy crawly bugs, there’s no end to the diseases and pests waiting to turn your tomatoes into a snack. Despite Mother Nature’s best attempts at ruining your hard work, for the diligent gardener, there is always a solution to the problem. Tomato hornworms are large caterpillar-like bugs that will eat your tomato plant’s stem, leaves, and fruit, and then move onto the next one! Although they’re pretty big, because of their light green color, hornworms are easy to miss, but once they start chowing down and damaging your tomato plants, you’ll know they’re there. Because hornworms are so big, the easiest way to take care of them is by simply pulling them off and throwing them into a closed container or bucket of water. 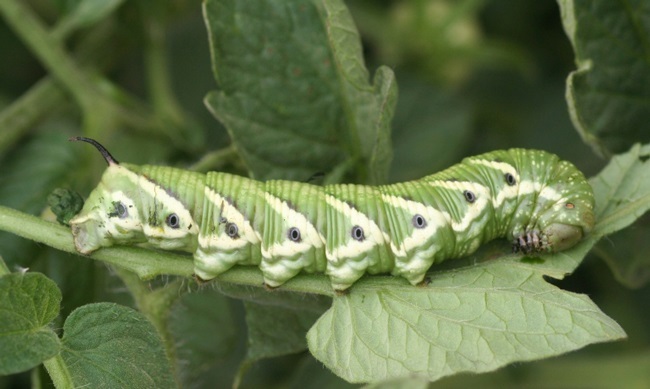 If the hornworm invasion requires a more potent solution, Bacillus thuringiensis (BT) spray is great at killing hornworms during their caterpillar stage and is safe for use on food crops. Using a rototiller before planting may also help destroy the hornworm larvae before they become a nuisance. Not only do these pesky pests eat tomato plants, they’ll also attack eggplants, potatoes, and pepper plants, so inspect your veggies closely! Besides hornworms, there are several other pests that can wreak havoc on your tomato plants. Aphids and cutworms love calling your delicate tomato plants their own personal home. Aphids are tiny green bugs that slowly eat away at your tomato plants. While hard to see, you’ll notice teeny tiny holes that seem to get bigger over a week or so. Eventually, this can kill the plant. Aphids come in large numbers, but due to their light green color, they blend in easily. 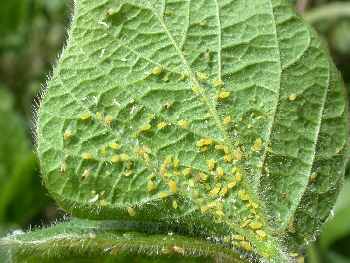 Your first step to stop the aphid invasion is to remove the foliage where the aphids have congregated and throw it away in a closed container. If the aphids have spread beyond a few leaves, your best bet is to spray a mixture of water, liquid dish soap, and canola oil. This solution is harmless to your plants yet makes it hard for the aphids to breathe. Another innovative aphid treatment is ladybugs! While we might think of ladybugs are harmless little bugs, they’re actually the #1 predator to aphids. Cutworms are tiny gray worms that chew on the stems and leaves of tomato plants. Worst of all, they do must of their munching at night, so you might not ever know they’re there until it’s too late. Inspect your plants’ stems and leaves in the evening, and if damage is present, it’s time to take action. A simple but ingenious solution is a cutworm collar. Use pieces of foil or cardboard to make a 4-inch circular barrier that extends all the way around your tomato plant’s base. Bury this about an inch into the ground and this will prevent cutworms from climbing up. If it’s too late for that, spray a pesticide onto the ground and the main stem of the tomato plant. Spreading a little diatomaceous earth onto the soil will also kill cutworms. You worked hard all summer to grow tomatoes, and just when you’re getting ready to pick one, you see it – a black moldy hole! Tomato rot (also called Blossom End Rot) is one of the most common tomato plant problems but also one of the most devastating. While it may not seem obvious, the number one cause of tomato rot is due to a calcium deficiency. Just like humans, plants need calcium to survive. 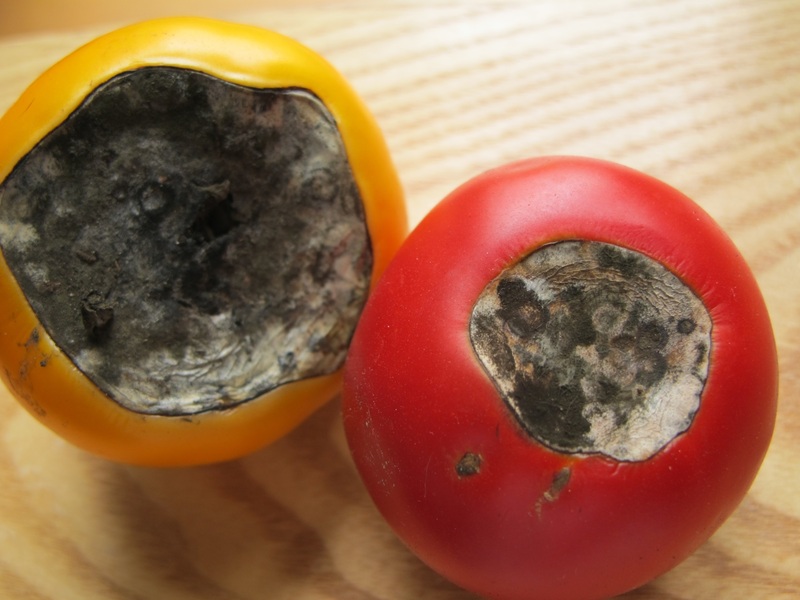 When a fruit or vegetable is lacking calcium, its tissues break down, resulting in rot. Too much ammonium sulfate from fertilizer, excessive watering, and low phosphorous levels can cause a calcium deficiency. You can prevent tomato rot by enriching your garden with organic compost, especially egg shells. Bone meal is also a great source of calcium. However, once rot appears on a tomato, there’s no going back and the tomato is no good. There is no surer of a sign that something is wrong than a wilting plant. Tomato wilt is one of the most serious tomato problems and usually means the end of the plant. 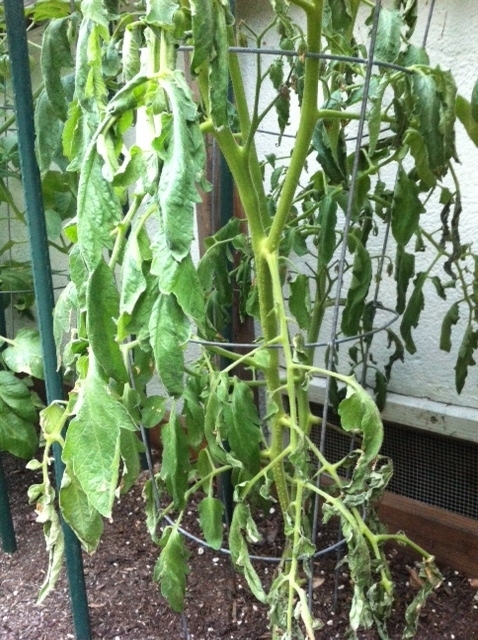 You’ll know it when you see it – your tomato plant will just lazily sag as if it was made out of rubber bands. Several factors can cause tomato wilt, such as over watering, lack of water, or infection. It can be hard to tell if you’re giving your tomatoes too much water or not enough, because the signs and symptoms can be nearly the same. As a general rule, a tomato plant needs about 1 inch of water a week. Another test is to lightly squeeze the stems and actual tomatoes. If they are limp and squishy, you’re probably overwatering. Once wilt starts, there isn’t much that can be done other than pulling the plant and throwing it in the garbage or closed container.